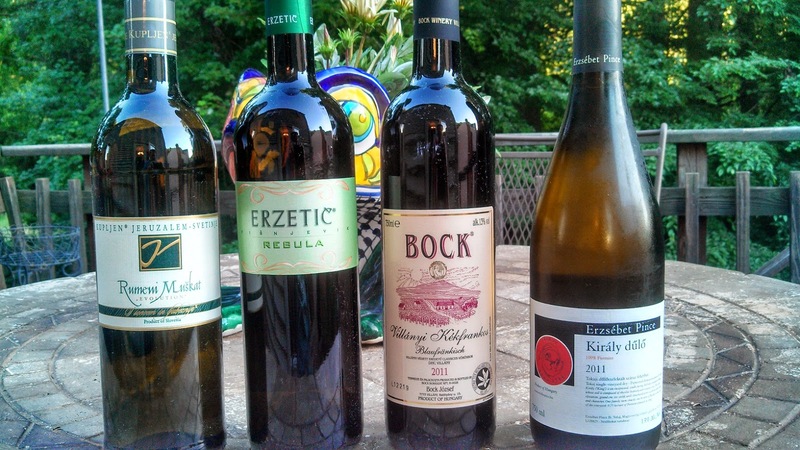 June starts off with another Protocol #WineStudio session, this time featuring Hungarian & Slovenian Wines imported by San Diego based Old World Wines. Katy Bendel Daniels started this venture after traveling through and tasting the wines of Czech Republic, Slovenia, Croatia and Hungary. In addition to selling wine from these countries, Old World Vines educates their customers on their history and culture. 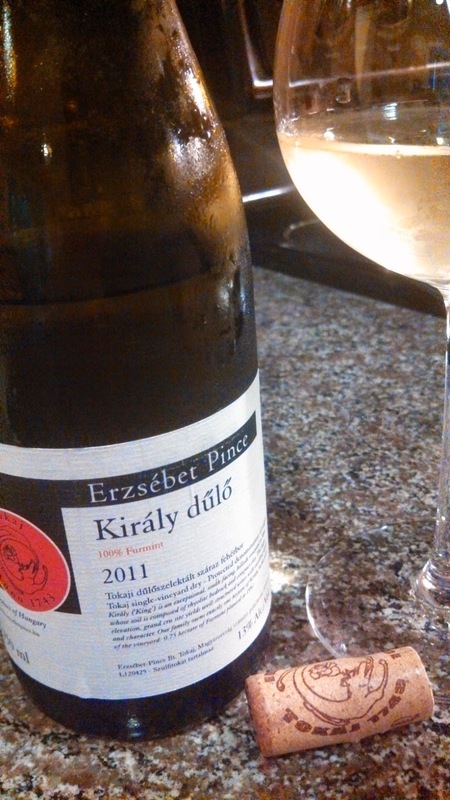 The first week of tasting featured two wines from Hungary: Erzsébet Pince 2011 Furmint Király dúló Tokaji and Bock 2011 Kékfrankos Villány, Hungary. Pince is Hungarian for basement or cellar and is used to name wineries, so Erzsébet Winery was created by Elizabeth and Miklos Pracser in 1989 - during the chaos following the collapse of communism. During communism, Hungarian families were able to tend family plots of vines solely for home wine consumption - a the Pracser family participated in. In 1989 they extended these family holdings and purchased a 300 year old cellar formerly owned by the Russian Wine Trade Company, "to supply the royalties with Vinum Regum, Rex Vinorum, the wine of kings, the king of wines". That refers to Tokaji Aszu the sweet botrytis dessert wines made from the Furmint grape. However, the 2011 Furmint Király dúló Tokaji ($32) is made dry - although it retains a touch of sweetness since some of the grapes in the Király vineyard is prone to botrytis and "fermentation also seems to stop regularly at around 5 grams of residual sugar". I found this one starts with a stone fruit aroma which leads to a wet rock, minerally; full bodied and deep profile. The acids were low with my wine, but others noted higher acidity. The minerality results from the vineyard's soil consisting of rhyolite bedrock & compact clay. A very complex and interesting wine; I think I need another bottle to decipher. The Bock family started making wine in the early 1700's in Hungary, but had their lands confiscated after WWII. And worse, people of German descent were evicted from the country in 1956, but Antal Bock was hospitalized at the time, refused to leave, and escaped deportation. He eventually re-purchased a grand cru section of the family's original vineyard in Villany and slowly restored the winery. Jozsef eventually took over the winery operations and received his 1st “Hungarian Winemaker of the Year” honor in 1997 and “Winery of the Year” in 2007. But this is a family affair with Jozsef’s wife, son, daughter, and son-in-law working together. The winery produces a large portfolio, with most of the reds made in the traditional style using large oak casks made from Hungarian Oak. Apparently, the winery also owns a forest of oak trees so have total control over the cooperage. 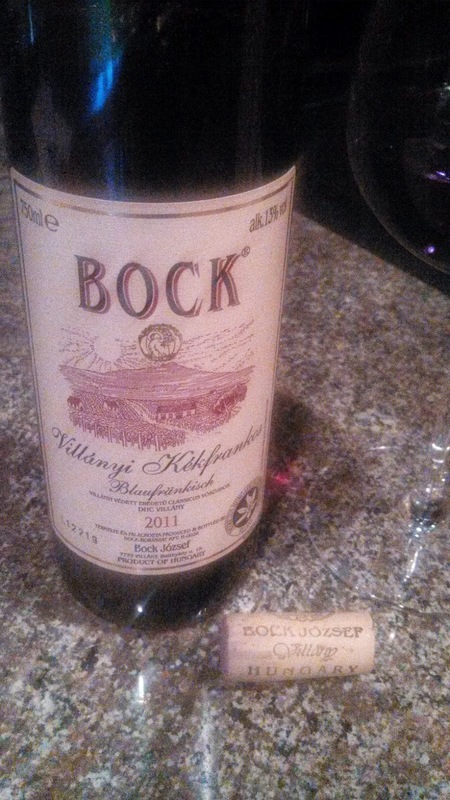 The Bock 2011 Kékfrankos Villány, Hungary ($23) is an easy drinking wine, I mean easy drinking. It's sour cherry aroma is followed by black fruit on palette with some leather and dark chocolate and finishes with low tannins and subtle pepper. Many of us agreed that hamburgers or lamburgers are appropriate. This is a great value wine - as @MsPullThatCork describes: "offers great flavor w/o the heavy tannins or weight of some reds". Next week we look forward to venturing into Slovenia with the Vino Kupljen 2011 Muškat Rumeni and the Erzetič Winery 2011 Rebula Visnjevik. Cheers.